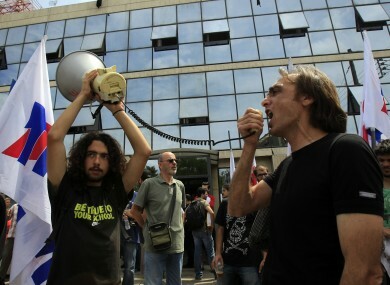 The solidarity demonstration coincides with a 24-hour general strike in Greece – the country’s third this year. Journalists, broadcasters and their supporters will gather outside the Greek Embassy in Dublin city centre tomorrow evening to protest the close-down of Greece’s equivalent of RTÉ. The demonstration has been organised by the National Union of Journalists, which says the government-enforced shutdown of ERT has “serious implications for democracy”. Greece’s ruling conservative-led coalition is facing a storm of public protest and a general strike over the decision, made as part of a deeply unpopular austerity drive. ERT’s television and radio stations were abruptly pulled off air late last night, and its 2,700 staff suspended. Prime Minister Antonis Samaras’s government defended the closure of the 60-year-old institution, saying it was a “haven of public waste” and too corrupt to save. “We are doing things correctly,” government spokesman Simos Kedikoglou said. But the sudden shutdown of ERT caused uproar, with journalists kicking off a 24-hour strike while defiant staff staged sit-ins at the organisation’s offices in Athens and Greece’s second largest city Thessaloniki. Riot police were stationed outside ERT offices around the country to prevent “any destruction”, said Kedikoglou, himself a former journalist at the organisation. “The ERT lockup amounts to a coup d’etat,” leading union GSEE said in a statement as it announced a 24-hour general strike for tomorrow, the third in the crisis-hit country this year. Public service broadcasting is essential to any democracy, and therefore the closure of any such broadcaster represents a major threat to democracy. Dooley said it was the job of public service broadcasters to ask “difficult questions” in times of crisis, and that his union had sent a message of solidarity to protesting ERT staff. Tomorrow’s protest takes place at 6.30pm at the embassy on Dublin’s Pembroke Street, off Fitzwilliam Square. Email “Irish journalists plan protest over shutdown of Greek broadcaster ”. Feedback on “Irish journalists plan protest over shutdown of Greek broadcaster ”.